Is the Sell-Off in Oil a Cause for Concern? WTI and Brent crude oil prices have lost more than 10% since mid April, closing at $47.84 and $50.84 per barrel respectively on 12 May. However, Citi analysts remain constructive on oil prices for the balance of 2017 as 2Q17 should see markets tighten as a result of the current OPEC/Non-OPEC deal whilst an expected extension of the deal on May 25 should keep oil inventories drawing in the second half of the year. This could push Brent to $60-65/bbl. Recent data from the US Department of Energy showed a decline in total crude oil inventories of 5.25m barrels vs 2m decline expected. Gasoline inventories, which had been rising in the past month and drove the recent fall in oil prices, also declined by more than expected. This is the fifth straight week in which crude oil stocks have fallen, and is the largest streak of back-to-back declines in US oil stocks since September. 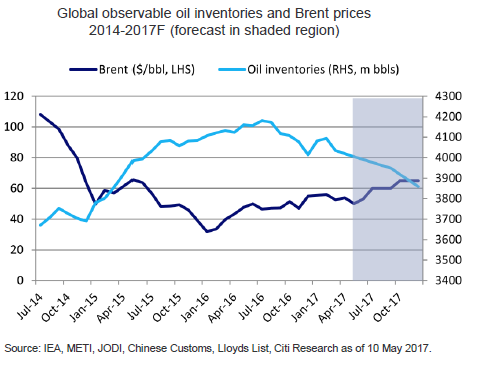 It is consistent with Citi analysts view that the oil inventories are declining as they should in this season. When we look back at history the last major joint OPEC/non-OPEC agreement on a coordinated production cut—in March 1998—eventually led to an inventory drawdown which took some time to materialize, but saw a 300m barrels decline by early 2000. In the end, the production agreement worked—300m barrels were taken out of the market over 18 months, and oil prices recovered. Finally, Citi analysts believe that the geopolitical risk premium in oil is underpriced, and that an escalation of Iran risk could result in a re-pricing of oil regardless of physical supply implications. Bottom line, Citi analysts see rising US-Iran tensions as being generally bullish for oil prices.